The balancing act in the Champaign County housing market has stayed on track for the first 7 months of the year. The 2012 inventory of homes for sale has been almost 12% below last years average. 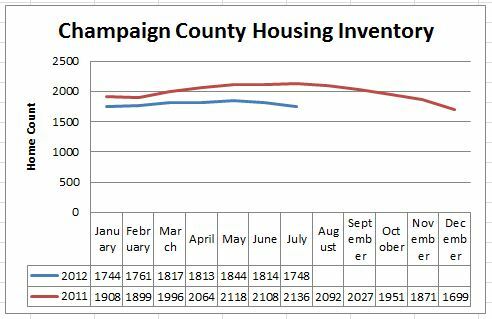 At the end of July there were 1748 homes for sale in Champaign County. As of this morning there were 1714. A turnaround in our local housing market will start with a balancing of the supply and demand. The reduction we’ve seen in the number of homes for sale in the past 12 months is one of the solid indicators of good news for Champaign County. Closely related to the inventory of homes is the absorption rate. This measures the months supply of homes currently on the market. A balanced market has 5-6 months of supply. Above 6 is a buyers market and below 5 is a seller’s market. 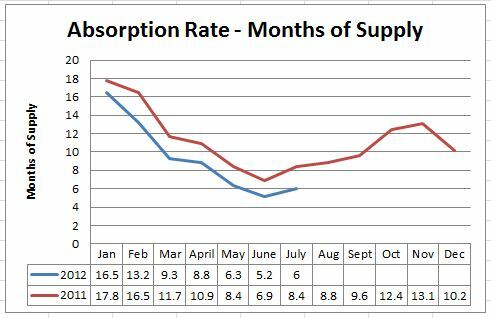 At the end of July Champaign County reported a 6 month supply, one of the best month’s we’ve seen in a long time. This number will almost definitely increase through the remainder of the year but remains consistently below last years housing statistics. Keep in mind that real estate is local. Your neighborhood could be better or worse than the averages in Champaign and Urbana. If you are thinking of selling make sure you are fully informed on the home values in your neighborhood. We track market statistics on a large number of Champaign-Urbana neighborhoods. If you have questions on your home or neighborhood please let me know.